The two best known and most widely followed stock indices in the world are the S&P 500 and the Dow Jones Industrial Average. While both follow large cap US stocks and both have long histories, they are quite different in some important ways. The Dow is the oldest regularly calculated stock index dating back to 1896. It began as 12 stocks, became 30 in 1928 after a series of changes and continues that way today. The Dow was created by Dow Jones & Company, the published of the Wall Street Journal and is now owned and maintained by S&P Dow Jones Indices. It is price-weighted meaning that the index is calculated by adding up the prices of the 30 stocks and dividing by the divisor. The divisor is used to prevent the index from changing when the stocks are changed. With price weighting, the highest price stock, IBM carries about 23 times more weight in the index than the lowest price stock, Alcoa. In fact, IBM has twice as much weight and a bigger impact on the index than ExxonMobil even though ExxonMobil is almost twice as large as IBM measured by market value. The S&P 500 is a relative new comer. It took its present form of 500 stocks in 1957 when the Standard Statistics 90 Stock Index, created in 1926, became the S&P 500. The 500 is value-weighted (sometimes called cap-weighted). The market value of all 500 companies is totaled and divided by a divisor. The divisor serves the same function for the 500 as it does for the Dow, preventing jumps when stocks are replaced. Since not every share of every stock is readily available in the market – some shares are closely held and rarely traded – the index is float adjusted to exclude closely held shares. Each company’s weight in the index is proportional to its size. For instance, ExxonMobil’s weight will be twice that of IBM in the S&P 500 unlike the price-weighted DJIA. 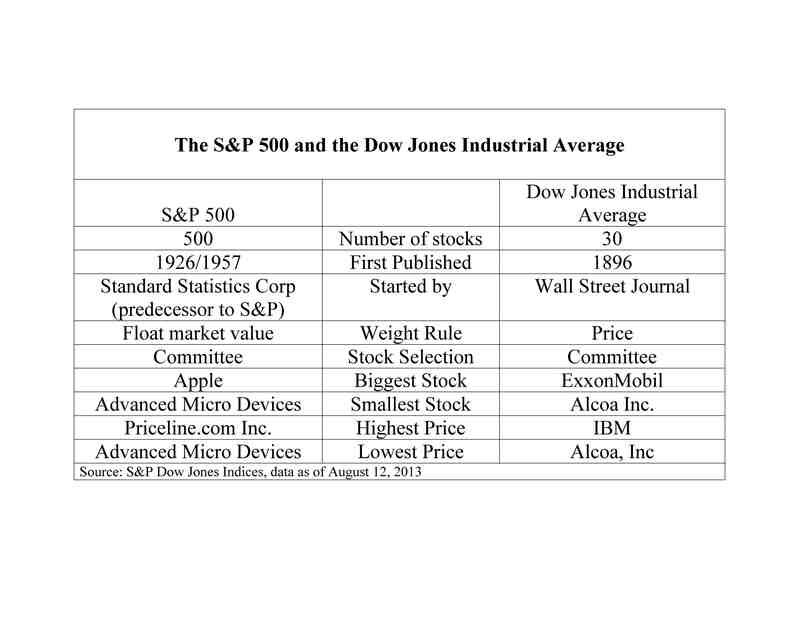 Because of the different weighting methods and the much larger number of stocks in the S&P 500 than the DJIA, the range from largest to smallest company, or highest to lowest price, is much greater for the S&P 500. The larger number of stocks in the 500 also makes it possible to divide the index and compare the performance of different parts of the market using sectors (technology, utilities, health care, financials, etc.) or styles (growth and value). Further, because the market is value weighted, the returns and volatilities measured with the S&P 500 give returns and volatility for the market. Overall both indices are widely followed and both are used to analyze and predict the market and to invest or manage risk through investment products based on the indices.